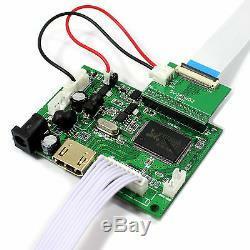 HDMI LCD Board Work for LVDS Interface LCD Screen. Input Power Adapter:12Vdc More than 2A. Come In Standby Model When Not Input Signal. OSD: Brightness Contrast Auto Language And So On. Language: English French German Spanish Italian And So On. Board Size:74mm x 53mm x 12mm. 7 HSD070PWW1-C00 1280X800 LCD Screen. Outline Size 161.6 ×105.8×5 (H×V×D). Display Area 150.72 × 94.2 (H×V). Contrast Ratio 800:1 Typ. (CR10) [Left / Right / Up / Down]. LVDS (1 ch, 6-bit) , Connector , 30 pins. Input Voltage 3.3V Typ. 1× HDMI LCD Controller Board VS-TY2660H-V1. 1× 7inch HSD070PWW1-C00 1280X800 LCD With Touch Panel VS070TP-A9. 1× Remote Control(Battery Not included). VSDISPLAY focuses on the LCD module, LCD display, liquid crystal display and corresponding control panel for over 10 years. 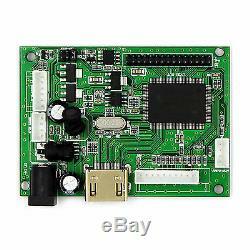 Currently available in a variety of HDMI VGA DVI USB Control Board and related LCD screen. To provide customers with LCD screen to the controller and the surrounding period of the solution. We guarantee that your issue will be solved quickly. We usually respond within 12 hours on workdays. The item "7 IPS LCD Touch Screen HSD070PWW1 C00 1280x800 HDMI Board For Raspberry Pi" is in sale since Monday, November 16, 2015. This item is in the category "Business & Industrial\Electrical Equipment & Supplies\Electronic Components & Semiconductors\LEDs, LCDs & Display Modules\LCD Display Modules". The seller is "chinatobby2011" and is located in shenzhen. This item can be shipped worldwide.